 flyMETRICS was founded by European experts in industrial sensing, complex systems and UAVs. We developed A2.WA.R.E. a technology providing multicopter systems with an unprecedented level of autonomy and extended operativity. A2.WA.R.E. 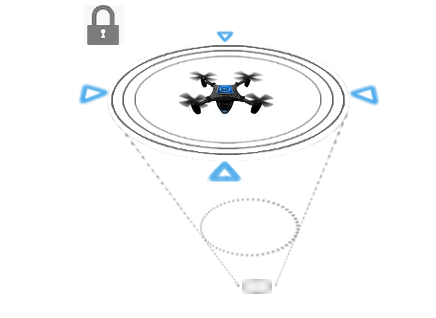 implements the revolutionary microdrone control system DENSOR-PHASE. Our mission is to make prolonged and unattended UAV operation possible and cost-effective. Thanks to its automatic battery swap system, and on-board drone control hardware, H20-UAS base station enables pseudo-continuous aerial operation (70% duty cycle), combining reliability and flexibility of deployment. 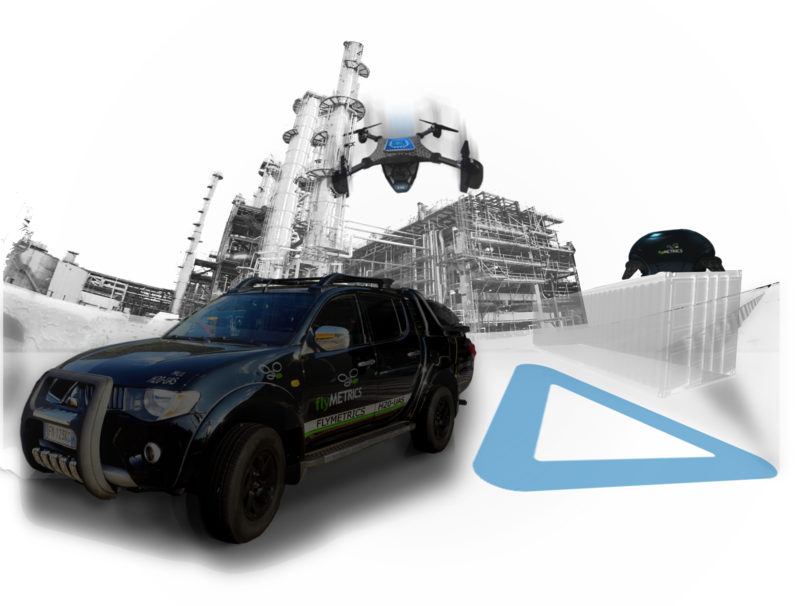 Local area operations such as inspection, sensing and surveillance can be performed, round-the-clock. H20-UAS base station is designed for weather-resistant, robust unattended operation. The best way to deal with strict regulations, is to be even stricter: A2.WA.R.E. systems implement self-restrictive hardware fencing to lock the drone in an operational 'box' - independently on GPS signal. H20-UAS was designed to serve applications where Return on Investment is maximized: frequent and heavy-duty drone operations. It provides a high level of automatization to minimise pilot/supervision efforts, and enables flying in a broad set of wind and meteo conditions. Windy conditions. 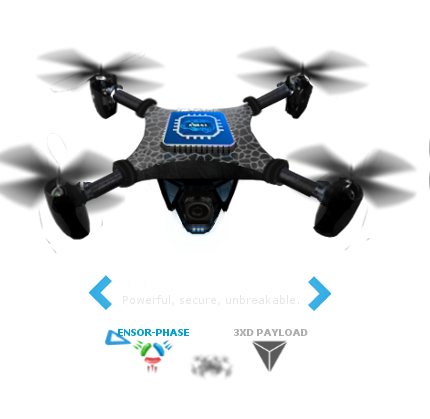 The flying unit D-PHASER incorporates a special wind stabilization system, which makes possible to operate the drone in harsher conditions (up to 20 m/s), compared to normal drones in its weight category. Only civil UAS in the world to integrate weather awareness, H20-UAS enables unattended operation in remote locations. By adopting a local weather scenario monitoring and Ultra-Short-Time (UST) forecast, the system forces the drone to land, activates take-off restrictions or triggers plan rescheduling. WITH MINIMAL OR NO SUPERVISION. SYSTEMS FOR EXTENDED AUTONOMOUS OPERATION. THE RISE OF RESIDENT DRONE SYSTEMS. What is a Resident Drone System (Re.D.S.)? and extended operation, with minimal supervision and maintenance. pseudo-continuously (20/24h), thanks to automatic landing and battery swap. 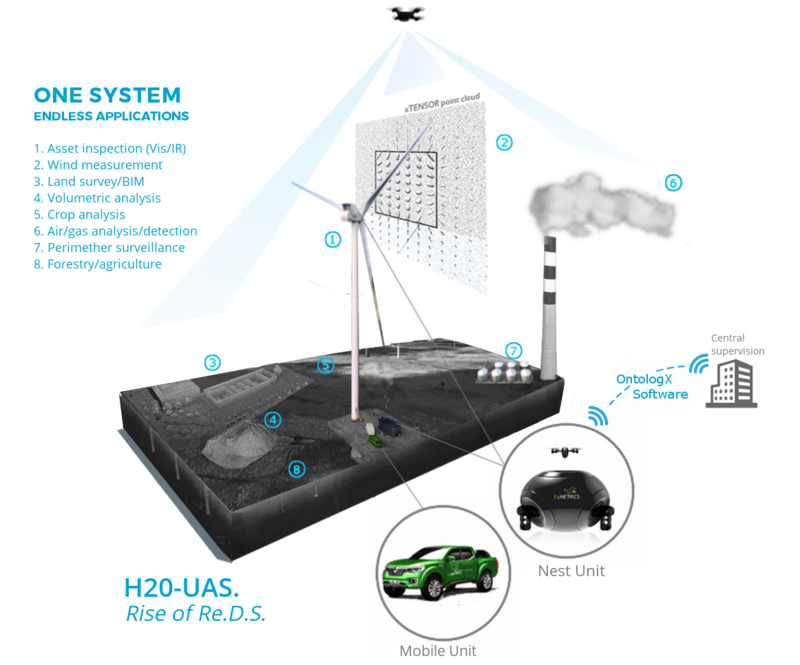 H20-UAS takes off and operates continuously as long as required. If upcoming bad weather fronts or unforecasted events threaten data acquisition or system integrity, the drone lands in time. Re.D.S. platforms ultimately enable the achievement of self-inspecting infrastructure. Wind. The drone performs continuous (10s sampling) wind measurement. Thanks to A2.W.A.R.E. 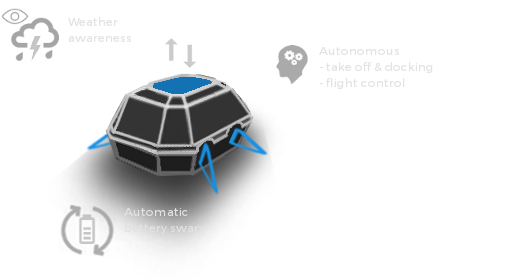 control and to a special shield, the D-PHASER drone offers unique stability in high wind (up to 20m/s). Powerful, efficient. While competitors struggle to reduce payload weight to gain minutes of flight, thanks to our automatic landing and swap we can focus on delivering control and functionality beyond limits. Your ROI. Our mission is to make aerial robotics accessible to many; that means system ownership costs kept at a fraction of the savings and benefits delivered. Re.D.S. When it comes to heavy-duty industrial applications, aerial robotics can get very complex. Re.D.S. PARTNERSHIPS are joint development type of cooperations related to multi-system installations in complex environment; one-of-a-kind projects/installations are an example. ACROSS DIFFERENT SITES OF YOUR ORGANISATION? platform, also in remote off-grid locations. Thank you for your interest in flyMETRICS. 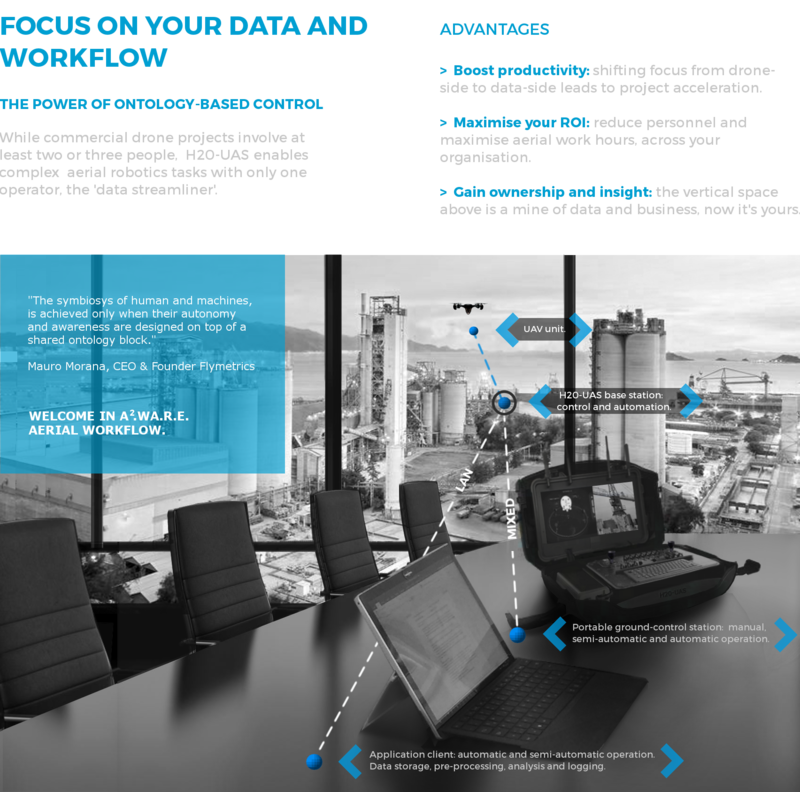 Do not hesitate to contact us to discover how to apply our technology to your business. is a European company headquartered in Warsaw, al. Jerozolimskie 85/21, Poland.